Next came R. Murray Schafer’s 1981 String Quartet no. 3. Schafer is one of the most distinguished quartet writers of our time, though one of the quirkiest as well. The majority of his quartets have gimmicks of one sort or another. The Third, for example, begins with the cello alone on the stage, soon to be joined by the other three instruments, each doing its own thing without much regard for the others. There’s an element of theater in any live performance. It’s definitely there in a standard formal classical concert, with the dress of the performers, the placement of musicians on the stage, the lighting, the entrances and bows, etc. And the gyrations of the players, or the conspicuous absence of body movement . . . there’s always a theatrical element. The standard concert ritual is so familiar that we become blind to it. Some pieces, some performers, purposely challenge the standard ritual by embracing the theatrical element more overtly. 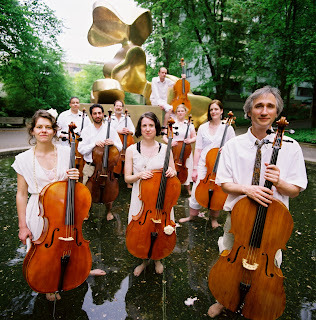 Just discovered the Portland Cello Project, via largehearted boy, a legal free music download blog (which I also just discovered). What a great example of a “post-classical” approach to music making, marketing, highly eclectic, multi-genre programming, alternative venues, etc. And, reading the member bios, some great examples of dual-career musicians: doing something else you also love for much of your living, and playing music professionally.